For those of you who are lucky enough to live in areas with mild weather, you can grow outdoor orchids all year round. But even if you are not among the fortunate ones, you can still grow select orchids outside part of the year. In fact, many types of orchids will benefit from a outdoor vacation with brighter light and stronger air movement. Some orchids also like the distinct drop of temperature in summer nights and the occasional refreshing rain showers. Depending on the zone you live in, you can grow many types of orchids outdoors. If your weather is hot and humid, like in Florida and Singapore, you can grow Vanda and Epidendrum outside. If your weather is mild during the day and cools down at night, like in Southern California or coastal Australia and New Zealand, you can grow Cymbidium in your garden. 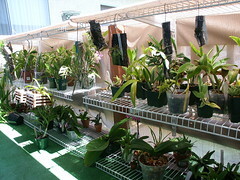 Cattleya, Dendrobium, Oncidium and many other orchids that like intermediate temperatures can be easily cultivated outside. Your homework is to find out the natural habitats of the orchids, then you will evaluate whether your outdoor environment is similar (or can be altered) to their desired living conditions. So read my Types of Orchids page to learn more about each type of orchids. First you need to find a suitable space for your outdoor orchids. Some sun-loving Vanda can be grown in the full sun as long as they are in very strong wind and receive several rain showers a day. However, for most areas, you should avoid full direct sun to be on the safe side. On the other hand, your outdoor orchids cannot be in the dense shade either. They need to have some light to be happy. It’s a tricky balance. For orchids whose permanent homes are not outdoors, it’s necessary to grow them in pots, baskets or mounts so that you can move them to various places throughout the year. In the summer, you can place them on benches under trees, hang them on the branches or place them under a shade cloth. The trees should allow some sun light to pass through, so that your orchids can receive filtered light. Moreover, the breeze will cause the leaves to move gently, so the sun is not directly shining on the same spot constantly. For permanent outdoor orchids, you can naturalize them by mounting them on trees. 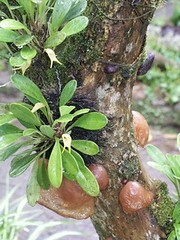 The roots of your orchids will eventually cling tightly on the trees. 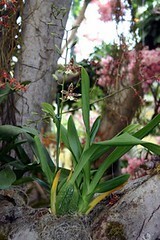 When first mounting an orchid onto a tree, you can use a little bit of moss to place between the tree and the orchid. Then you can tie with a fishing line or a strip of pantyhose to secure the plant. Epiphyte orchids cannot be grown in the soil, but you can build a raised bed filled with well-drained orchid mix. In the Singapore Botanical Gardens, I’ve seen orchids grown in large chunks of horticulture charcoals in the slightly raised beds outdoors. They receive almost daily watering and are slightly shaded by tall trees. In you live in a mild-weather area, you can have a similar setup by having a 3-foot (1-meter) raised bed filled with large chucks of barks and charcoals. Vanda alliance and Dendrobium orchids will be suitable for this type of setup. 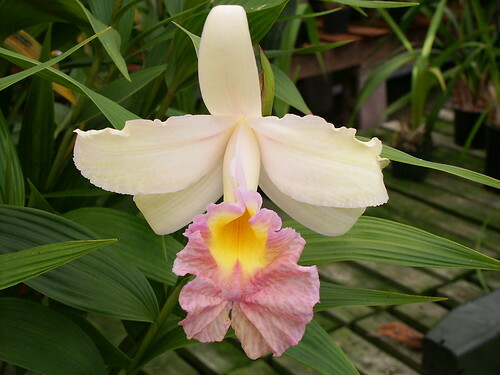 Terrestrials orchids, such as Sobralia, Pleione, Bletia, Phaius and Calanthe, can be grown directly in the ground, just like any of your garden plants. But these orchids still need to be grown in well-drained area. Replace your garden soil with a terrestrial orchid mix, such as a mixture of sand, gravel, bark and fibrous loam. Make sure frost has passed before putting your orchids outside. Some orchids can tolerate a very brief time in frost, but a lot of them cannot take it. Your orchids might not be able to take the sudden increase in light and get burnt. So it’s best to ease your orchids into their summer home outside. Put your orchids in a spot that is only slightly brighter than your regular growing area at first, then gradually move them to a brighter area. Outdoor areas have more garden insects and pests than indoors. Be sure to regularly spray your outdoor orchids. I mix horticulture oil or neem oil along with several drops of liquid dish washing detergent in the water every 3 weeks or so to kill some small pests. Also, be sure that your orchids are raised off the ground so that critters don’t easily crawl into the pots. To avoid sunburn, put your orchids under trees or shade cloth. But no suntan lotion! Don’t put your orchids under complete shade. They need light to grow. Because it is brighter and less humid in open areas, your orchids will dry out faster. Be sure you water your orchids more frequently. If you live in an area with constant rain, it’s best to grow your orchids bare root on a tree branch or in a basket. Otherwise, your potting mix will rot with too much water, and the orchid roots will suffocate and die.